Joni in the Spotlight Stamping: COLORING LACY! Maybe you hopped over from Helen's blog. She's not feeling well this week so be sure to leave her a extra encouraging comment to cheer her up! Now with all the Christmas crafting, it was hard to come up with something non-holiday for this card! I guess I could've gone holiday, but I figure this will probably be my last non-Christmas card for a bit! So the first combo seemed more "wintery" than the second, so that's what I went with! For the lace part I used the really cool Delicate Details Lace Tape. It come with 2 little spools of lacy tape in the package! All ya do is peel & stick! I really like them! The stamp set used are my trusty old Mosaic Madness (with of course the Mosaic Punch & Mosaic Embossing Folder) and the Best of Greetings! I'm gonna miss those "best of" stamp sets! The ones I like I really love!!! 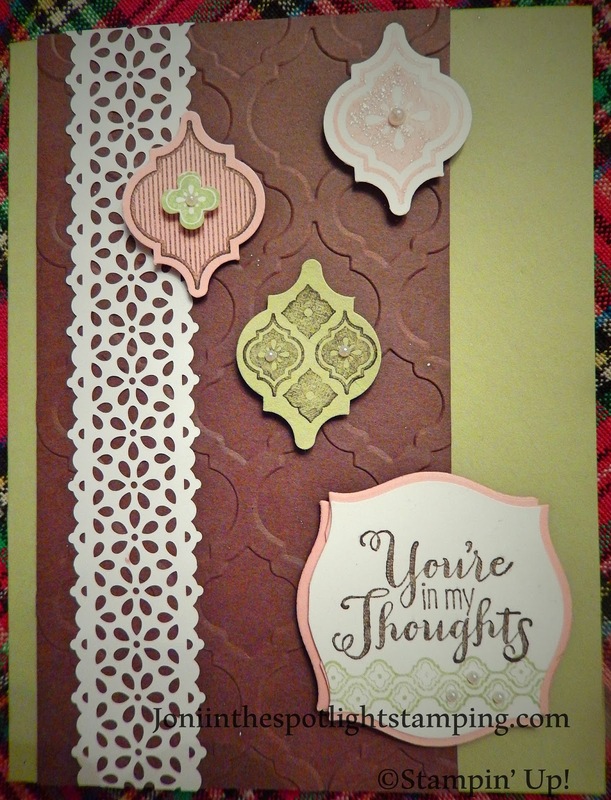 Throw in a framelit, some Pearl Basics & a little Irredescant Ice & ya got a cute card! So I'm pretty sure I'll be on to Christmas next week! Gotta get to work on my Christmas cards! I'm all ready with my 12 Days of Christmas cards for ya tho! Be sure t watch for them! So hop on over to Liz's blog & see what she did with her lacy touch! Lovely for sure!!! So nice. Lace fits beautifully with the mosaics. Thanks for the idea. Great challenge. Refreshing change from holiday cards! Good job on this challenge!